Congratulations! You have reached the 14% commission level. What Next?! With your coach use this Business Plan and 6 Months to SC to help focus and plan to achieve your Goals. Your next Goal is to Qualify your Business, on your way to Sales Coordinator. 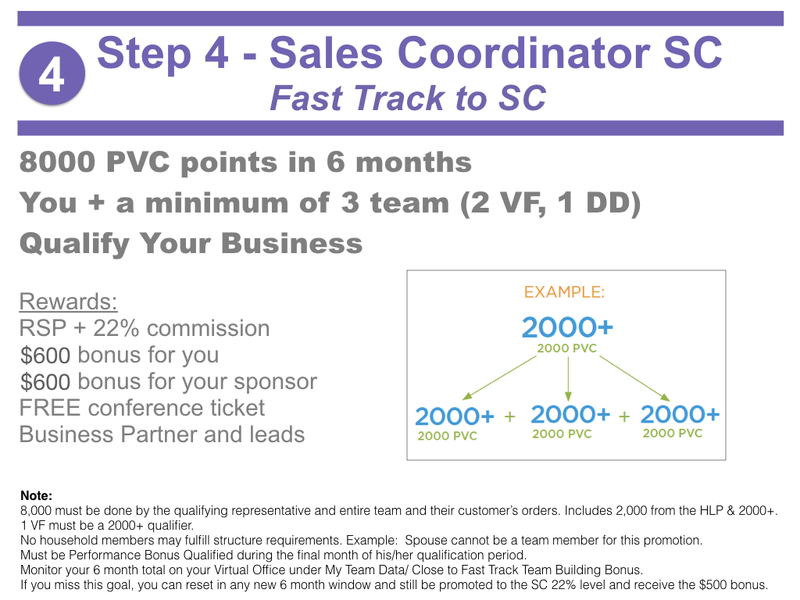 The Fast Track to Sales Coordinator Program (and worksheet) will help you achieve this promotion to the highest commission level in the JP+ Virtual Franchise. A Qualified Business is a key foundational business goal from here forward. The Mission Driven Model now becomes the heart of your Daily Method of Operation. These 5 things we all do consistently to build our business: we Plan – Invite – Share – Follow Up – Care. As you continue to do those 5 things, your Focus now is on growing your monthly ‘points’ (pvc) to and past 1000 each month to build a solid Qualified Business with 30-40 customers, and a growing team. This volume comes from your own orders, from your customers, and from your Dealers and Direct Distributors (who are not under another team member at the VF level or above). You will quickly qualify your business by continuing to find customers and another team member each month, and helping your team members to do the same. Start your month with your Invitation List; use the 20-10-5-1 Success Formula with Intention and Invitation. Get 10 Preferred Customers each month until you reach your goal of a solid Qualified Business. Master the art of Customer Care. This is absolutely key to developing enthusiastic customers who will take Juice Plus+ long term, who will spread the good news (giving you referrals), and some of whom will join your team as Juice Plus+ Reps.